Studying some organic gardening tips can help to speed up the learning process, if you want to become good at organic gardening. There are lots of skills and techniques which help with growing vegetables and plants organically - some found in mainstream gardening, others less well known. These organic growing tips will help you to make your garden flourish with an abundance of organic fruit and veg and flowers! A mulch is simply a covering layer put on top of the soil. Organic cultivation usually involves mulching. You can use mulches for a whole variety of purposes. You protect the soil from drying out and from sudden temperature changes. A good mulch also suppresses the weeds. Non-organic gardeners often use inert materials as mulch; this can help keep weeds down and keep the garden tidy. You can buy weed control mats and weed-block fabrics for this. As an organic gardener I like mulches to be feeding the soil as well as protecting it. A good organic mulch is being broken down by living organisms and the nutritional value of the mulch is being delivered up to the soil in a way that plants find easy to absorb as they grow. To use organic mulch is to imitate nature. 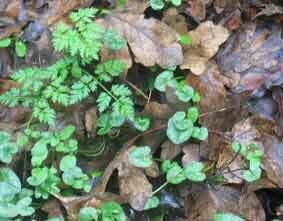 If you go into a forest the floor is often covered with a mulch of dead leaves. The leaves gradually rot down and in about three years they have sunk down to soil level and they are being broken down and digested by micro-organisms – and bigger things – to produce new soil. So a good mulch enriches the soil by providing nutrients and improving soil structure. What can you use as mulch? You can use practically any organic matter as long as it is not too fresh. A good quality well-rotted compost is the best all-round choice. See here for how to make your own compost. Animal manures are probably my next choice because they are rich in nitrogen, so help build up fertility. They do need to be well rotted. If they are too fresh they will literally scorch nearby plants, as manure gives off heat as it rots. Well-rotted manure adds both fertility and conditioning elements to soil. Micro-organisms thrive and the soil teems with plant-friendly life. Manure from any domestic farm animals is suitable. They all have their different qualities. Cow and horse are probably the easiest to find, most places. But use what is nearby and available - it's all good! One problem to be aware of, however, is the tendency of natural organic mulches to harbour weed seeds. Some of the worst weed seeds may be hiding in horse manure, for example. If there is a suspicion that the free horse manure you have been offered comes from a weed-strewn paddock, make compost with it before you add it to your soil. I had a wonderful crop of thistles from a generous neighbour who gave us free manure! There's also a safety issue with using manure in organic cultivation. Be careful when handling fresh manure. Use stout gloves and wash your hands well afterwards to prevent possible contamination. Make sure that you are protected against soil-borne diseases such as tetanus. While manures make excellent plant food, they can be hazardous in the wrong place! Organic gardening tips: Other accessible choices include straw, sawdust and wood shavings. These all tend to rob the soil of nitrogen to help them break down, so they are best composted first. Many animal manures are mixed with straw or wood shavings and this makes them even more useful as the plant matter helps the soil's structure, making it light and easier to work. If there is a mushroom farm anywhere in your neighbourhood you may be able to get spent mushroom compost. It can make an excellent soil conditioner as well as feeding the soil. It is worth using only if the mushroom farm is organic - otherwise you are just adding chemical traces to your soil. These also make a good mulch but they don’t supply much nitrogen compared to other mulches. They take about three years to rot down. Make leaf mould at home for a ready source of rotted leaves. It is well worth collecting any fallen leaves and letting them quietly get on with it. Most people don't want soggy leaves all over the garden, so it's simple to rake them into piles and bag them up to rot. You can do this at any point in the winter to suit you. Some gardeners argue that it is good to let them lie on beds, where they help keep the plants snug and frost-free. I compromise by raking up the leaves on the lawn and pathways but letting the rest lie until spring. Rather than use recycled bags, you can put your leaves into a holding pen made from wire mesh. You could also use a compost bin. The simple, lidless plastic ones are ideal. See here for more on compost barrels and bins. Use your leaf compost as a soil conditioner and to suppress weeds. Use it anywhere you would use compost. Before the advent of potting composts, peat and the like, leaf mould was what gardeners used for starting plants. I haven't tried this yet - maybe next year. It's easy to see when your rotted down leaves are ready: the consistency is almost like soil, perhaps a little flaky. There are no visible leaves left. Paper, cardboard and plastic can all be useful, as can purpose made mulching mats and weed suppressors. They will all cut down moisture loss. There is no nutritional benefit to plastic, beyond reducing moisture loss from your soil. Paper and cardboard will eventually break down and add a little to soil composition. Do not use paper with glossy colour printing on it; the inks tend to be toxic. If you don’t mind recycling old plastic grow bags or compost bags or any other sturdy plastic waste, then that can be a useful way of organising a temporary mulch. Just weight every thing down with bricks or old tiles. This can be quite a help when suppressing weeds on ground which is waiting for you to find time to cultivate it. You can also use old carpet for this kind of crude weed suppression. Large sheets of plastic can be very useful for killing or weakening weeds on a new growing areas. Thick black or dark coloured plastic is best; see though plastic is of limited benefit because the plants will still be receiving light. Of course, using recycled plastic or cardboard may not impress the neighbours, so you may prefer to use this method just as a very temporary expedient to help control an over-grown garden or allotment. You can, if you prefer, buy purpose-made mulch matting or weed suppressing matting. To dig or not to dig - that is the question! This is a subject which exercises the minds of many organic gardeners. Can mulching really take the place of digging? Many gardeners are stoutly in favour of digging at all costs. Personally, I’m pretty much in the no-dig camp simply because I want to let the worms and micro-organisms do most of the work rather than me! Nevertheless, it's not exactly a lazy option: you need to add plenty of top dressings for this method to work properly. The no-dig route to garden success depends upon you supplying the soil with masses of organic matter, (mulches and composts) to increase fertility. Growing vegetables is quite a drain on the fertility of the soil, so you must constantly keep putting back nutrients. Many vegetables need a lot of nutrients to grow and flourish. If you do not take care of their needs your harvest will be small. Both these soil needs (structure and nutrition) are served by good quality compost and manure. When you lay down an organic mulch on top of the soil, the organisms in the soil (such as earthworms and beetles) help to break down the organic matter and gradually draw it down deeper into the soil. The organic matter in the mulch also feeds the micro-organisms in the soil. Micro-organisms are responsible for transporting nutrients to the roots of plants. This is probably the single most important reason for using organic mulches. You are creating a vibrant ecology around your plants which will help them to grow. As in nature (think forests with their layers of leaf litter), mulches feed the soil from above. Picture above: Wooden logs can form a useful barrier. The nutrients will gradually add to the soil as the logs deteriorate. So is there really no need to dig? Digging can be very useful in order to break down a hard pan in the soil. This is where a hardened layer of soil has built up over time. Deep-rooted plants like comfrey and some legumes (pea family) may also be able to break down hard layers of soil to some extent. It is certainly true that you will see better results faster if you take the trouble to carefully dig and weed a new plot. And the further down you dig the better - except you don't want to bring up sub-soil. If you dig down one or two spits, in most cases that is sufficient. (A spit, is a spade depth, or about 8-10 inches.) You'll know if you have brought up sub-soil if the colour changes and the soil is stony and rough. Sub-soil is nutritionally poor and you don't want it near the surface where most of your plants have their roots. Some gardeners set great store by double-digging i.e. digging down two spits or more. For those that have the time and energy, I'm sure it can pay dividends, especially if you incorporate lots of good manure or other fertilising organic matter. 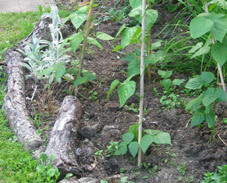 For me, the main use of digging is to clear weed from a neglected plot before preparing a seed bed. If weeds have become established it may take too long to suppress them with mulch matting etc and they may be too strong to simply hoe off. In this situation, a light digging usually does the trick. For the most part, I prefer to keep adding organic mulches which feed the soil. For breaking new ground I let potatoes and other deep rooted crops to do most of the work! If you keep adding organic mulches you should find that your soil becomes richer and more fertile year on year. Organic cultivation is like compound interest! Every year your soil gets a little richer and can support more wonderful healthy plants. If you are growing your own vegetables, you are investing in your family's health, too. In organic cultivation you generally use much the same tools as you would if you were taking the artificial route (except the spray gun!) – i.e. you will need a fork, spade, trowel, hoe, wheelbarrow, etc, depending on how far you are taking your organic cultivation. If you only want to grow plants in containers, you might be able to get away with just hand tools, for example. If you are growing potatoes, and a variety of plants and flowers you will probably need a wider range of garden tools. Good tools make garden jobs easier and are a pleasure to work with whereas poor quality tools are often a false economy – they may break easily and often do not do such a good job, or they are heavy and hard to wield. So when you choose a new garden tool, always consider who is going to use it. If it is for yourself, pick it up and weigh it carefully in your hand. How does it feel? Is the handle long enough? Is it too heavy for you to use effectively? This can be a really important consideration if you are a small build or elderly. One of the most crucial organic garden tips is to pay careful attention to tool selection! In addition to standard tools, I have found a couple of things really useful. A mattock is a versatile tool. It has to be the greatest tool for all round cultivation. You can use it as a large hoe or where you might use a spade or fork. This type of mattock is sometimes called a grub hoe or eye hoe. See the Amazon image on the right hand side for a picture of what I mean. The kind of mattock used in the building trade for breaking earth is too heavy and short for gardening use. You can use a mattock or grub hoe to clear ground by skimming weeds off the top and hew out troublesome weeds, even bramble roots. You can also use it to dig shallow holes. Unfortunately all the ones I have seen are really quite big, designed for and by muscular men no doubt! My mattock cost me 20 pounds about 4 years ago. I would say it’s worth its weight. I tend to use it in short bursts as it is quite hard work (and good exercise!) Some people will find that a good spade suits their purpose better. A spade will certainly skim weeds from the surface if it is sharp. Smaller mattocks or hoes can be found but I've yet to see a good middle sized one suitable for an average sized woman. A small mattock is a good tool for preparing small areas of ground before planting. Here is a video of one in use. If you are prone to back problems you should take advice before using one. Breaking your back is not a necessary part of green living! Mattocks are used extensively by women in Africa as the cultivation tool of choice. Some of the older onion hoes are like miniature hand mattocks and are very good, whereas most of the modern ones seem to be very light weight. It's worth looking in junk shops and car boot sales for good quality old tools. The machete is also a most wonderfully versatile hand tool for organic cultivation. It can be used easily for pruning, clearing, cutting twine, edging beds. I even use it for hoeing sometimes when I want to get in close to plants in a confined space. I always wear gloves and I don’t sharpen it up too much. A machete is a pretty dangerous thing in the wrong hands, so always keep it well away from children or irresponsible people. Take time to build your skill in using a machete. Always chop away from yourself and always wear stout gloves. I hope you will find these organic gardening tips useful. Organic gardening tips on weeding will be added very soon. You can also find more organic gardening tips in the section on growing food: Green Grow. There are some organic gardening tips for particular crops as well as more on soil cultivation.